My love affair with roasted brussel sprouts continues. I just had to come up with a few more ways to enjoy them before the seasons change and our supermarkets stop stocking them. One of my favorite ways to eat them is roasted with a squeeze of lemon and parmesan so I just added some bulgur and white beans to round this side into a main dish. The result is fresh, simple, delicious and oh-so healthy meal. Antioxidant rich: The cauliflower and brussel sprouts contain vitamin A and C that help repair cells and boost immunity. Remove toxins: Lemon juice helps stimulate your liver, which is responsible for breaking down toxins. Brussel sprouts also contain isothiocyanates and sulforaphane, which neutralize carcinogens and help detoxify environmental toxins. Cancer-fighting properties: Sinigrin in the brussel sprouts suppresses the developement of precancerous cells while the isothiocyanates and sulforaphane found help inhibit proliferation of cancer cells. Build muscles: Protein from the beans and bulgur. Weight control as well as improved digestion, nutrition absorption and regularity: All these benefits are from the fiber in this meal, which comes from the beans, veggies and bulgur. 1. Preheat oven to 400F/200C. Cook bulgur in a pot according to directions on package. 2. 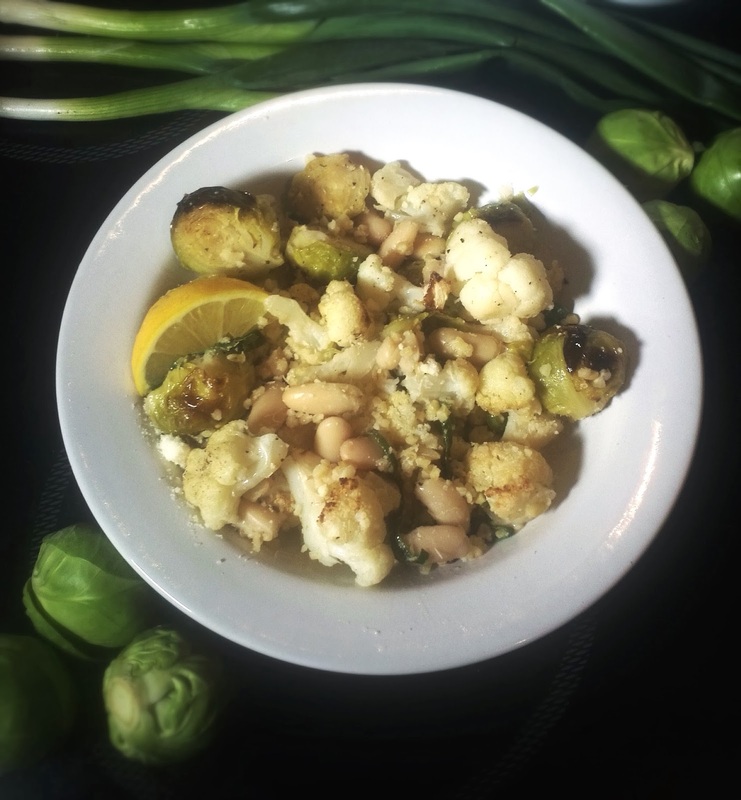 Cut brussel sprouts and cauliflower. In a medium bowl, toss vegetables in olive oil and salt and pepper. Spread parchment paper on a baking sheet and pour vegetables out evenly onto pan. Roast for 25-30 minutes, turning halfway through. 3. Allow vegetables and bulgur to cool until they are just warm and not piping hot. Combine in large bowl with white beans, lemon juice, parmesan, garlic, spring onions and olive oil. Season with salt and pepper.